I have to admit: I was one of those non-believers. I didn’t like the circus. At all. But once you have kids of your own, you do a lot of things you would never have considered before like, well, the circus. 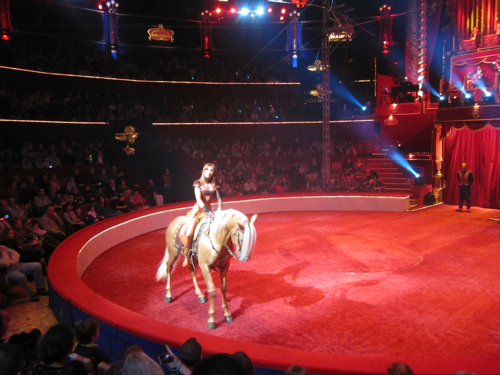 But I’m part of the converted now: From now on, I’ll go and see the Bouglione show at the Cirque d’Hiver. I’m on my way to becoming an addict. The Bouglione family bought the beautiful Cirque d’Hiver on Boulevard du Temple in the 1930ies – when the boulevard was still called boulevard du crime, which in French means exactly the same as in English: crime boulevard. It was, back then, a theatre district with a lot of entertaining going on. The circus building, an oval polygon of 20 sides, inaugurated in 1852 by Napoleon III and recently restored, is an attraction in itself. And then there is the Bouglione family: originally Gypsies from Italy, they’ve built a real circus empire expanding further and further, and I wouldn’t be surprised if they will be noted on Wall Street some day. The newspaper Le Figaro has already talked about Bouglione’s “megalomania”. They are a clan of 102 members, the oldest one, Rosa, has just celebrated her 100th birthday. Others have been cast out of the family and the Parisian ring and are now doing their own thing in Belgium…. But they are all driven by this very special circus spirit which is a kind of pride, too. Year after year they present a new show in the winter circus, every year with a new, sonorous title: Audace, Artistes, Voltiges, Prestige, you name it, and you won’t need much of a translation. It’s about bold, edgy artists, about flashy shows and fleshy girls sometimes, bling-bling and glitter. 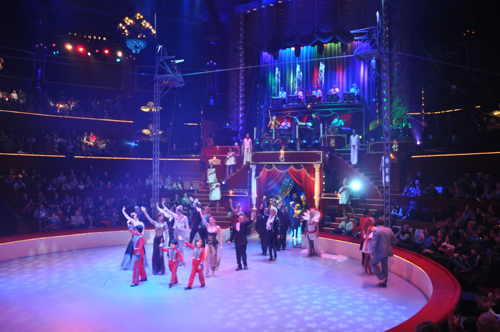 At Cirque d’Hiver, you will find a sumptuous décor, some amazing acts, and an audience under its spell. 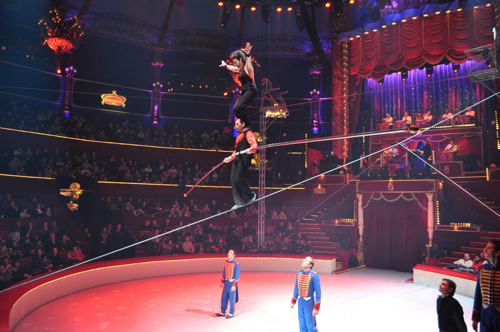 The acrobats, trapeze artistes, jugglers make your heart stop for a second. The dramaturgy is perfect and after each thrill comes a moment of relief.